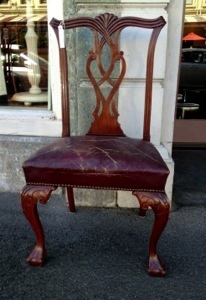 A very interesting set of cedar chairs upholstered in leather. From the ball and claw foot up the shapely leg to the generous wide seat. Past the fretwork splat to the carved rail. Everything about this set of chairs seems to hark back to the comfortable elegance of a Chippendale chair from the mid 1700’s. We believe this set to have been made in the mid to late 1800’s. $1200 for the set.